Chapter member Margaret Chatham contributes these definitions in conjunction with plants being featured in our Potowmack Newsletter. All photographs are by Margaret Chatham unless otherwise noted. Circinate: coiled with the tip in the center, as a fern fiddlehead or the stipules of some hawthorns. 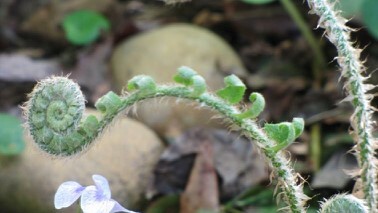 Shown here, fiddlehead of Christmas fern (Polystichum acrostichoides). Photo by Laura Beaty. Culm: a hollow or pithy stem, especially in the grass (Poaceae), sedges (Cyperaceae), or rushes (Juncaceae). Shown below: mixed fertile culms and leaves of Eastern Star Sedge (Carex radiata), at Fraser Preserve, 5/23/14. Culms don’t always stay upright. Decussate: describes a plant with opposite leaves on which each pair of leaves comes out at right angles to the pair above and the pair below it, like some milkweeds. Determinate/Indeterminate: Describes flowers that bloom in a bunch, determinate bloomers start at the tip of the spike or twig, and progressively open more flowers lower on the spike (as Dense Blazing Star (Liatris spicata) on the left) or on side branches (as Black-eyed Susan (Rudbeckia hirta) or Buttonbush (Cephalanthus occidentalis)): the end of the stalk is already determined when the first flower opens. 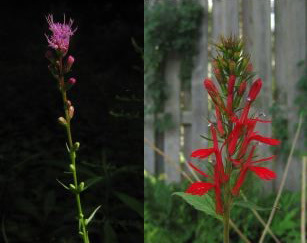 Indeterminate bloomers open from the bottom up or from the outside in (as Cardinal Flower (Lobelia cardinalis) on the right): it isn’t obvious how long the stalk will become when the first flower opens. Dextrorse/Sinistrorse: twining by the right hand rule: a vine that twines in the direction your right hand fingers curl while growing in the direction your right thumb points. Sinistrorse: same idea using your left hand. 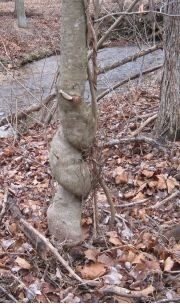 This young Beech tree (Fagus grandifolia) at Fraser Preserve has been shaped by a dextrorse twining *Japanese Honeysuckle vine (Lonicera japonica). This distinction can be diagnostic. *Chinese Wisteria (Wisteria sinensis) is dextrorse, while *Japanese Wisteria (Wisteria floribunda) is sinistrorse. Native Wild Yam (Dioscorea villosa) is sinistrorse, while *Chinese Yam (Dioscorea polystachya) is dextrorse. Endozoochory: plant dispersal by seeds traveling through the gut of a bird or animal, like all those lovely berries you see waiting to be eaten in the winter. This includes natives such as dogwoods, spicebush, magnolias, and Mayapples (spread by box turtles), but also many invasive exotics, like Autumn olive, English ivy, and burning bush. Forb: a seed-producing, non-grass plant that has no woody stems and so dies back to the ground at the end of the growing season. May be annual, biennial or perennial. Guttation: the exudation of liquid from an uninjured plant surface, most often seen as droplets at the tips of leaf veins on moist mornings. Check your unmown grass tips or strawberry leaves. Gynecandrous/Androgynous: description of the arrangement of flower parts on sedge spikes that contain both staminate and pistilate flowers. Gynecandrous spikes have the pistilate flowers grouped above the staminate, while androgynous spikes have the staminate flowers grouped above the pistilate. Pictured below left: the gynecandrous terminal spike Short’s sedge (Carex shortina) along with lower completely pistillate spikes. Pictured below right: the androgynous terminal spike of Wildenow’s sedge (Carex wildenowii). Photos by Gaylen Meyer. Imbricate: overlapping like roof tiles or shingles, derived from Latin from Greek meaning rain. The imbricate flower bud of Rhododendron catawbiense is shown. Marcescent: withering but hanging on, like the leaves of some (especially young) oak and beech trees. Mycoheterotrophic: parasitic on chlorophyllic plants by means of a mycorhizal fungus. Myrmecochory: seed dispersal by ants. Plants like bloodroot, trilliums, and wild ginger grow a fatty attachment to their seeds called an elaiosome. Ants carry home the seeds, eat the elaiosomes, then discard the seeds in places well apart from the parent plant. This is why spring beauties may need your help to cross a road. Noctodorous: releasing fragrance only at night. One example of a noctodorous flower is the Cranefly Orchid (Tipularia discolor), which blooms in July and August, long after its leaves have disappeared for the summer. Peltate: shield-shaped, like a leaf with the stem attached to the middle of the underside rather than an edge. Examples: Mayapples (Podophyllum peltatum), American Lotus (Nelumbo luteum) and Whorled Marsh-pennywort (Hydrocotyle verticillata). Ruderal: of a plant growing in disturbed habitats, or of a habitat subject to frequent disturbance. Spathe: large bract or pair of bracts subtending or enclosing the inflorescence in monocots. Our largest spathes include the showy spathes of Skunk Cabbage, Symplocarpus foetidus, and Common Jack-in-thePulpit, Arisaema triphyllum, but there are many smaller spathes to be found.